Last month Nick Voke appeared on the front cover of Golfer Pacific because he won a tournament at just his second start on the PGA Tour China in his first year as a professional golfer. But Voke again appears on the magazine’s cover because that win was merely an entree of what was to follow. Voke won twice more on the PGA Tour China to rack up three wins in the space of just five weeks. Voke’s world ranking vaulted from 911 before the first win to 258 after the third win. Voke had just five starts on the PGA Tour China but finished third on the tour’s order of merit with earnings of 987,500 Chinese yuan. That’s nearly $NZ217,000. But more importantly, because he finished within the top five on the China order of merit, he earned a place on the Web.com Tour in the United States. That’s the development tour to the world’s richest golf circuit, the PGA Tour. The Web.com Tour starts in mid-January. All this is happened for the Auckland golfer in less than 12 months. It was only at the beginning of the year that he turned professional. Voke was not afraid to voice his aims to mix it with the world’s best players. ``The ultimate ambition is to be on the PGA Tour,’’ Voke said after the third PGA Tour China win. Voke’s first win in China came in the Qinhuangdao Championship in September when he prevailed in a play-off. Three weeks later, in the very next tournament of the PGA Tour China, Voke won again. This time it was the Macau Championship. On this occasion the win came in the regulation 72 holes with an eagle on par five 71st hole helping pave the way for victory by two shots. 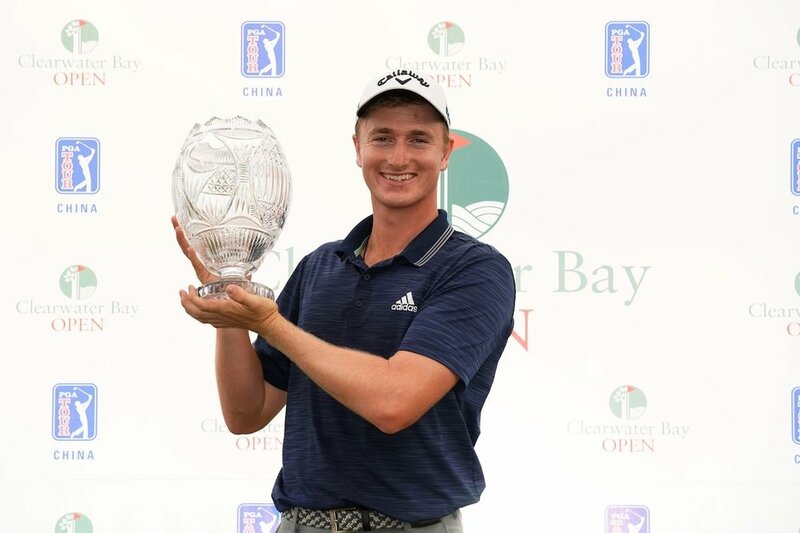 Voke finished 16th at his next China start but the very next week righted the ship when he won the Clearwater Bay Open. He was the leader by five going into the last day’s play at Clearwater Bay and with a third consecutive round of three under par 67 he won comfortably. He finished the tournament at 14 under par and his nearest rival was three shots in arrears. Voke, who turned 24 the day after the Clearwater Bay event, was delighted with his run of top form and wondered just where the future would take him. ``It’s been a really awesome run of golf and I’m really excited to see what I do in the next couple of years,’’ he said. ``This win means a hell of a lot, to be honest with you. ``The first couple of victories I managed to come from behind, so to come out here (at Clearwater Bay) with a five-shot lead and know that everyone is chasing me, it’s a different sort of victory. Voke had admitted he was shaking with nerves while in the lead in the third round on the Saturday, but managed to stay calm in front of big crowds and hold on to the lead by carding four birdies and one bogey. Voke had also made only one bogey in each of his previous three rounds. ``I drove it very well all week and didn’t make many opportunities to make bogeys. I only made four in the end so that just summarises how it was for me out there. Just very solid and steady golf. Despite feeling some pressure from runner-up Callum Tarren entering the back-nine, Voke remained calm and managed to grind it out on the back-nine. ``The first time I saw the leaderboard was on the ninth green and I knew Callum was going deep and I had to keep things going if I wanted to win,’’ Voke said. The PGA Tour established PGA Tour Series-China in 2014 as its third international developmental tour, following in the footsteps of PGA Tour Latinoamerica and the Mackenzie Tour-PGA Tour Canada.